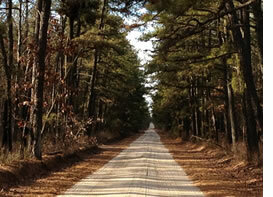 (15/P65) TRENTON – The New Jersey State Park Service is preparing to launch a Motorized Access Plan to protect the environment and encourage responsible use of Off-Road Vehicles, or ORVs, in Wharton State Forest, located in the heart of the Pinelands National Reserve. The Motorized Access Plan, or MAP, consists of a driving map that delineates a nearly 225-mile network of sand and other unimproved roads that is open to motorized vehicles, as well as a colorful and information-packed brochure that highlights Wharton’s ecological treasures and explains the long-term damage that can be caused by improper off-roading. The Park Service expects to begin implementing the plan – the first of its kind in the state – by late summer. Brochures and maps will be available at the Batsto Village Visitor Center, located off Burlington County Route 542, east of Hammonton, and at the Atsion Recreation Area, located off Route 206 in Shamong, Burlington County. At 125,000 acres and sprawling over much of Burlington County and parts of Camden and Atlantic counties, Wharton State Forest is by far the largest unit in the State Park System. The State Forest protects rare plants and animals, some found nowhere else in the world. It also encompasses some of the most remote areas in New Jersey. Over the years, some ORV operators have utilized trails not intended for vehicle use to access ecologically sensitive areas, damaging plants and habitats for wildlife and leaving ruts and gullies in wetlands and sandy areas. Off-Road Vehicles are legally registered pickup trucks, Jeeps and similar vehicles equipped with four-wheel drive capabilities and special tires that enable them to access rugged terrain. All-Terrain Vehicles, also known as quads and three-wheelers, as well as unregistered dirt bikes, are not permitted in Wharton or on other state-owned lands. “The Motorized Access Plan will enhance our enforcement capabilities and make emergency response actions, including wildfire response, much more efficient,” Texel added. The development of the brochure, map and route was funded by a $600,000 federal grant that is also helping the Park Service to make repairs to roads, including filling in deep gullies that have formed. Many vehicles have to go around these gullies, resulting in unintended widening of existing roads into forested habitats. Wharton provides habitat to some 300 bird species, nearly 60 reptile and amphibian species, and more than 90 fish species. The DEP lists 43 animals as threatened or endangered, including the Pine Barrens tree frog, timber rattlesnake, and pine snake. The State Forest also boasts some 850 species of plants, including wild orchids, sedges, grasses and insect-eating plants. Rare plants include the bog asphodel, swamp pink and Pine Barrens gentian. The predominant trees are the pitch pine, various oak species, and Atlantic white cedar. The latticework of roads and paths through the State Forest were primarily built in the 18th and 19th centuries to connect villages that supported a variety of industries, including iron-making, glassmaking, timber and agriculture.